Falling into the category of Jewish religious garments, the tallit and its tzitzit are an integral part of the daily experience for boys who've reached the age of three. Tzitzit (ציצית) translates from the Hebrew as "fringes" or "tassels," and is pronounced either as "tzitzit" or tzitzis." The tzitzit are closely related to the tallit (טָלֵית), also pronounced either as "tallit" or "tallis," which translates from the Hebrew as "cloak." The mitzvah, or command, to wear tzitzit originates in the Torah, the Hebrew Bible, in Numbers 15:38-39. "Speak to the children of Israel and say to them: They shall make for themselves fringes on the corners of their garments… And this shall be tzitzit for you, and when you see it, you will remember all the commandments of God, and perform them." The command here is quite simple: Every day, wear a garment with tzitzit so that you remember God and the mitzvot (commandments). It was common daily practice in ancient times for the Israelites to wear a simple garment with four corners with the commanded tzitzit. However, as the Israelites began to disperse and blend into other societies, this garment likely fell out of common practice and one garment evolved out of necessity into two with the tallit gadol and tallit katan. The tallit gadol ("big cloak") is the prayer shawl that is worn during morning prayers, services on the Sabbath and holidays, as well as special occasions and festive days. It is often used to make the chuppah, or wedding canopy, under which a man and woman are married. It is typically quite large and, in some cases, has colorful embellishments and can also have a decorative atarah — literally "crown" but usually an embroidery or silver decoration — along the neckline. The tallit katan ("small cloak") is the garment that is worn daily by those from the time that they've reached the age of bar mitzvah. It is similar to a poncho, with four corners and a hole for the head. Upon each of the four corners is found the uniquely knotted tassels, the tzitzit. It is typically small enough to fit comfortably underneath a t-shirt or dress shirt. The tzitzit, or fringes, on both garments, are tied in a unique way, and tzitzit tying customs vary from community to community. However, the standard is that on each of the four corners there are eight strings with five knots. This is especially meaningful as the gematria, or numerical value, of the word tzitzit is 600, plus the eight strings and five knots, which brings the sum to 613, which is the number of mitzvot or commandments in the Torah. According to the Orach Chayim (16:1), the tallit must be large enough to clothe a child who is able to stand and walk. The tzitzit strings must be made of wool or the same material from which the garment is made (Orach Chayim 9:2-3). Some use strings of techeylet (תכלת‎) within their tzitzit, which is a blue or turquoise dye mentioned countless times in the Torah, especially in regards to the garments of the High Priests. In Orthodox Judaism, a tallit katan is worn daily, with a tallit gadol or prayer shawl used on the Sabbath, for morning prayers, on holidays, and for other special occasions. In the Orthodox world, boys begin being educated in tzitzit and start wearing a tallit katan at the age of 3three, because it is considered the age of education. 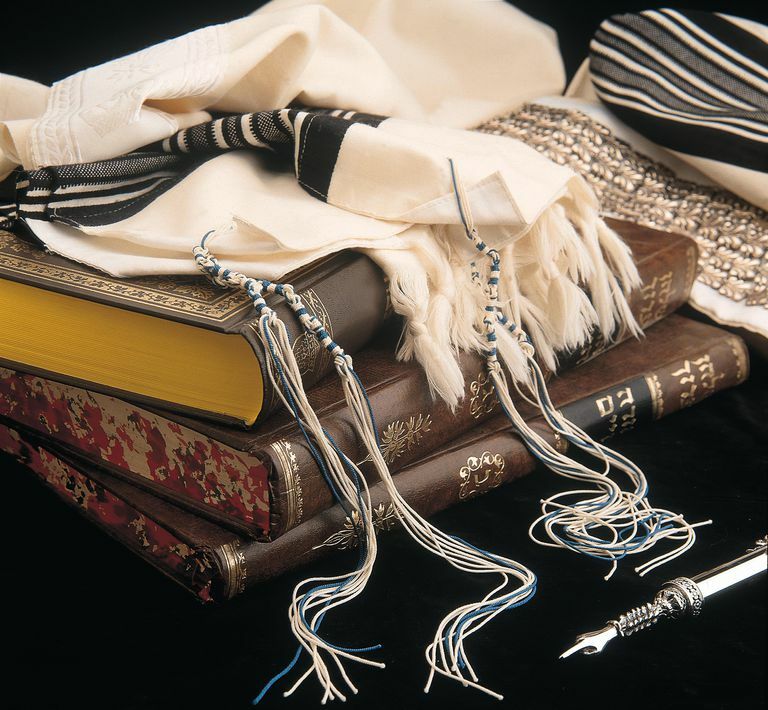 In Conservative and Reform Judaism, there are those who follow the Orthodox practice and those who only use a tallit gadol, but daily do not don a tallit katan. Among Reform Jews, the tallit gadol has become smaller in size over the years and is a much narrower shawl than that worn in traditional Orthodox circles. For those who don the tallit katan, a prayer is said in the morning upon putting the garment on. Baruch atah Adonai, Eloheinu Melech ha'olam, asher kideshanu b'mitzvotav v'tzivanu l'hit'atef b'tzitzit. Blessed are you, Lord our God, King of the universe, who has sanctified us with His commandments, and commanded us to enwrap ourselves with tzitzit. For those who are placing tzitzit on a new garment, such as a tallit, or replacing damaged tzitzit on a tallit, a special prayer is recited. Baruch atah Adonai, Eloheinu Melech ha'olam, asher kideshanu b'mitzvotav v'tzivanu al mitzvat tzitzit. Blessed are you, Lord our God, King of the universe, who has sanctified us with His commandments, and commanded us concerning the mitzvah of tzitzit. Much like with tefillin, the obligation to wear tzitzit is considered a commandment that is bound by time, for which women are considered not obligated. However, among some Conservative and Reform Jews, it is common for women to wear a tallit gadol for prayer and less common for women to wear the tallit katan daily. Why Do Jewish Men Wear Yarmulkes?